Plant these invitations and watch them bloom like the Hearts in Bloom. 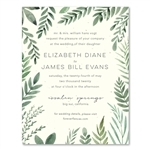 This unique design is perfect for a garden wedding filled with joy and love. Printed on premium handmade 100% recycled paper, which will bloom into wildflowers once planted. Featured in Purple & Lavender, Tangerine, and Deep Purple. Custom colors welcomed!